Saturday, October 20, 2018 ~ 10:30 a.m.
Regina Tomsicek, 90 of Weston, NE entered into eternal rest Saturday, October 13, 2018 at the Saunders House in Wahoo, NE. 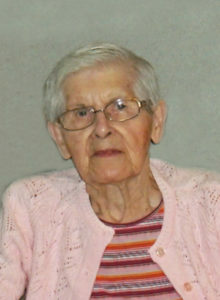 She was born April 11, 1928 in Wahoo, NE to Frank and Victoria (Bartek) Furasek. She attended Rural District 74 country school. She was united in marriage to Laddie Tomsicek on November 14, 1949 at St. Vitus Catholic Church in Touhy, NE. From this marriage two sons where born, Duane and Dennis. Regina was a stay-at-home mom and a farmer’s wife always ready to help out. She enjoyed baking, gardening and Polka dancing with her husband, Laddie. She was a member of Sts. Cyril & Methodius Catholic Church and a member of the Altar Rosary Society. Regina is survived by her son, Dennis Tomsicek of Garden City, KS; grandchildren, James Tomsicek and Michelle (Cory) Hardy all of Henderson, NV; great-grandchildren, Rilynn and Kase Hardy; daughter-in-law, Betty Tomsicek of Lincoln, NE; brother-in-law, Joe Tomsicek of Weston, NE. She was preceded in death by her parents, Frank and Victoria Furasek; husband, Laddie Tomsicek; son, Duane Tomsicek; sister, Lillian Tomcak; brother, Frank Furasek. You are in our thoughts and prayers, as is your mother – may she rest in peace. You were a faithful and loving son to her as you were a loving friend to Paula and Eleanor. We hope you find peace in the memories you have of her. I am so sorry to read of Regina’s passing. I always enjoyed visiting with her when I would come see my mother. Thoughts and prayers going to the family. She is in God’s hands and he will take care of her. Dennis and family – All of the Eagle’s family here in Garden City have you in our prayers for comfort and peace. Dennis, thinking of you and your family during this time. So sorry for your loss and praying for peace and comfort for all. Dennis, Thinking about you during this time of sorrow. I will miss talking to your Mother. Will have a mass said for her at my Church. Dear Dennis, So very sorry to hear about the passing away of your Mother. Your love ones will always be near and dear to your heart♥️ Including Paula and Eleanor Knoll Family.